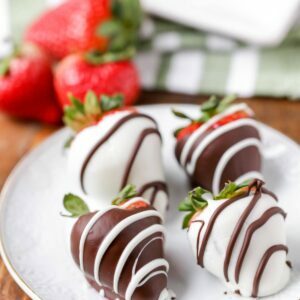 How to make Chocolate Covered Strawberries - a simple and quick tutorial on how to make everyone's favorite treat that is perfect for snacking, special occasions and even Valentine's Day! 1. Begin by rinsing your strawberries. Place them on a paper towel to dry. Line a baking sheet or pan with parchment paper. Place Strawberries right next to your pan. Also, place a hot pad next to the pan for when the chocolate is melted. *NOTE: Sometimes the parchment paper doesn't stay very well and starts to roll back up. To stop this I will spray a little cooking spray on the pan and then put on the parchment paper. Melt your Candy Coating. This can be the tricky part, but the trick is to do only a few cubes at a time on LOW heat, stirring CONSTANTLY with a rubber spatula. Yes, it may take at least 5 minutes and your hand gets tired, but your candy will melt perfectly. When candy coating is completely smooth, remove from heat. Hold your pot of chocolate at an angle. Grab strawberries by the stem and dip both sides in the chocolate and place on your parchment paper. Continue doing this for all strawberries. Let Strawberries set on your counter until hard. Melt opposite chocolate and place in a Ziploc bag with a small cut in the corner. Drizzle back and forth over dipped strawberries. Let set or place in fridge to set more quickly.